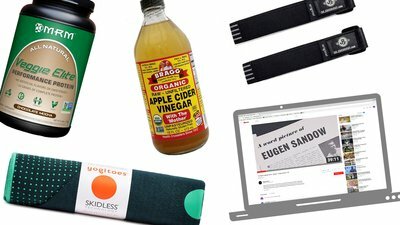 From apple cider vinegar and veggie protein powder to gym gear and a brief history lesson, this month's editors' picks will make you healthy and wise. Whether you're trying to get lean or build mass, high protein is the way to go. Protein shakes are an easy solution, but dietary restrictions can make whey-based products a no-go. If you're looking for a plant-based source of protein that is both delicious and effective, look no further than MRM's Elite Veggie Performance Protein powder. Made from pea protein isolate and brown rice protein, this all-natural protein is free of artificial sugars but somehow manages to still taste great! Whether you're dairy-free, meat-free, gluten free, or completely vegan, this protein powder has you covered. Dr. John Rusin Blood Flow Restriction (BFR) cuffs have been custom developed after years of testing to provide outstanding performance and premium feel. They have the perfect feel for muscle occlusion during training, along with equal distribution of tension throughout the band due to three lines of elastic reinforcements. BFR is no longer a niche training modality. It's officially hit the mainstream, and for good reason: It allows lifters to get a serious strength-and-size stimulus using light, joint-sparing weights. That's why it's a staple component of one of our most popular training programs, Project Mass: Jacob Wilson's 14-Week Muscle-Building Trainer, as well as part of Look Strong, Lift Strong: Layne Norton's Legs and Arms Blast. Weightlifting as we know it today has its roots in the early 20th century, embodied by such early stars as Charles Rigoulot, and Katie Sandwina, and Louis "Apollon" Uni. But of them all, the star that continues to shine brightest is Eugen Sandow. This Rogue Legends video traces Sandow's life from his days as strongman, circus performer, and strength athlete. At one time the physical instructor to the King of England, Sandow is credited for being one of the first fitness celebrities, a man who ushered in the era of fitness taken seriously. This film shows how Eugen Sandow, namesake of today's Mr. Olympia trophy, helped people change their minds about their bodies. Spread this towel on top of one of those dubious mats you find at the gym or yoga studio and, voila, you have a clean, absorbent surface for doing core work! Silicon nubs on the bottom keep it from bunching up, it comes in a bunch of fun colors, and it folds up compactly so you can throw it in your gym bag. Best of all, you can keep it smelling like daisies instead of gym socks by simply chucking it in the washer! Nine years ago, I was struggling with repeatedly losing my voice, until then-CEO of Micron Technology, Steve Appleton, told me that he gargled with Bragg's Organic Apple Cider Vinegar to keep his throat healthy during winter months. I thought, if it's good enough for a tech titan, I'll try it—and I've been yodeling about Bragg's raw, unfiltered vinegar ever since. It's a natural antiseptic, so irrigating with a teaspoonful every few days during the cold-weather season can really revitalize. You'll find it in most groceries for a song, at around $4 a bottle.